Local First will host the second annual Eat Local Harvest Dinner on Saturday, Sept. 9. The event will include a five-course meal and will be served on the lawn of the Smiley Building. On Saturday, Sept. 9, Local First will host the second annual Eat Local Harvest Dinner. The event celebrates La Plata County’s fresh produce, grass-fed meats and artisanal beverages with fine-dining and live music. The event begins at 5:00 p.m. on the lawn of the Smiley Building with a toast to food security in Southwest Colorado. A five-course meal prepared from a secret menu will then be served to guests seated at long community tables. The Harvest Dinner is held in the midst of Local First’s Eat Local month, celebrated every September since 2010. Tickets for this year’s Harvest Dinner are $100 and include taxes, gratuities, food, cocktails, beer and wine. Tickets go on-sale June 20th; quantities are limited and will sell fast, so attendees are encouraged to purchase tickets early online at local-first.org. All proceeds benefit local farmers and Local First’s efforts to promote local food purchasing through the independent business community. 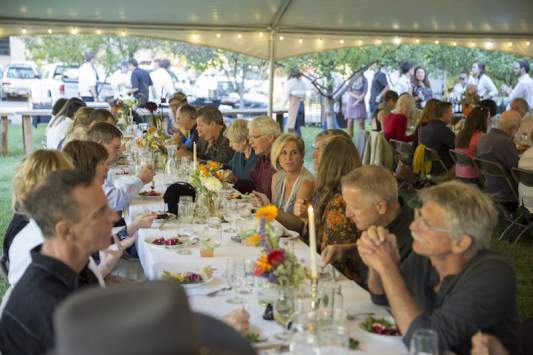 The Eat Local Harvest Dinner will be held from 5 to 8 p.m. Saturday, Sept. 9, on the lawn of the Smiley Building, 1309 E. Third Ave.
Tickets are $100 and include a five-course meal, all alcoholic beverages, taxes and gratuities. To learn more, visit local-first.org, or call Monique DiGiorgio at (970) 799-6618 x1.